There was a certain amount of disbelief when Uwe Boll made a ‘ok-ish’ movie in the shape of ‘Rampage’. 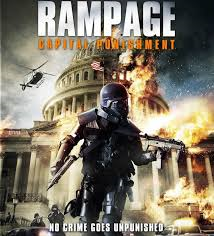 Thankfully he is back to form on with its sequel – ‘Rampage: Capital Punishment’, Boll delivers a real turkey stuffed full of OTT violence and overlong ranty political guff. ‘Rampage: Capital Punishment’ cleverly brings us up to speed on what happened to the first film’s antagonist Bill Williamson. Bill went into hiding for a couple of years after his massacre, now he’s back planning another atrocity that will get America’s attention. Boy he sure is angry about the state of his nation. Uwe Boll has given the film a point of view feel, which comes from the immature mind of the kind puny male who goes on a shooting spree, and then in its aftermath, all the tabloid bin sniffers dig out a tatty manifesto that has been either posted in a blog or uploaded to YouTube, and label this deeply troubled and disenfranchised young man insane in their hallowed pages under the guise of news. In recent times we’ve seen countless school shootings, and at its worst in recent years we’ve had the Boston marathon bombings. After these tragic events occur fingers are pointed towards the media, violent movies, violent video games, lack of parenting, aggressive music, because some angry young man has gone ballistic. Boll taps into the fear, but does so clumsily, not particularly making an original point, yet somehow holding a cracked mirror to popular culture, politics and new media. There’s a plot line involving a news anchor named Chip who has one eye on the changing political landscape and the rise of whistleblowers and hactivists like Julian Assange, but is preoccupied with ratings and boardroom pressure from his Producer (played by Boll); but mostly this film is a mess of empty rhetoric without any incisive original thought. Is Boll saying that peaceful protest gets you nowhere? Perhaps so, I mean the crisply shot ISIS (IS?) beheading videos and other such viral propaganda released this year have seemingly spoken to thousands of disillusioned young men and women, causing them to trek across the world and partake in war games, it is a call to arms in a way that the short lived OCCUPY movement wasn’t. This revolution, which popular figures like Russell Brand talks about, needs to go viral, but in the mind of Bill Williamson, that revolution needs to begin through violence. As the audience, are we supposed to agree with the sentiment of Williamson’s views? We certainly can’t condone his murdering ways, but his points are ultimately overshadowed by the violence. He tries to get our attention, but all we see is red. 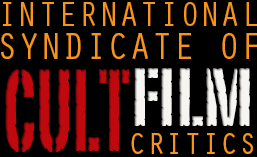 This entry was posted in Reviews and tagged anti-American, massacre, Rampage, Uwe Boll, violence. Bookmark the permalink. your personal training studio is using a Facebook fanpage.